The Downtown Windsor Farmer’s Market only has 5 weeks left, butdon’t be sad as the fall harvest is a great one and they’re planning lots of fun for each week. Koehn’s will have the last of their corn ready for this week – buy it fresh or get a cob for lunch at the hot buttered corn booth! We will also see grapes, squash, apples, pears, carrots, walnuts, herbs, peppers, beets, sweet potatoes, beans and more. Faerhaven will be bringing natural soaps (to keep your skin moisturized all winter long), hand creams (great for healing and preventing those wintertime cracks on dry hands and feet), and body butters, along with lip balms, just in time for the colder weather. The Boy Scouts will be out for Apple Day so bring your spare change in exchange for a fresh snack while you shop! There will also be a have a new vendor this week who will be selling hot breakfasts including pancakes! 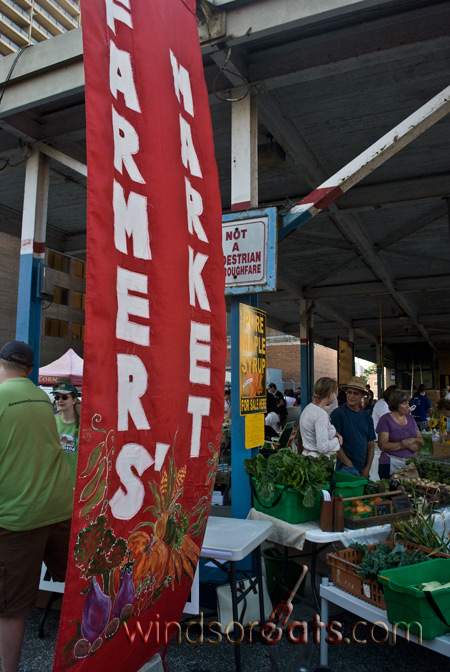 Visit the market from 8am to 1pm and stock up on fresh and local goodies. Also, to mark on your calendar, the famous Red Green will be at the market on Saturday, October 9th from 9:30am to 11:30am. He will have copies of his new book available for signing, “How to Do Everything From the Man Who Should Know”.